I stumbled upon this book by chance. One of the stories from this collection was featured in a list of 18 Perfect Short Stories and everyone I talked to said they’d only heard good things. I made it a goal to read all the collections on the list and let me say, as far as this book is concerned, I was not disappointed. There wasn’t a story in here that I didn’t love, or that I’ll ever be able to forget. 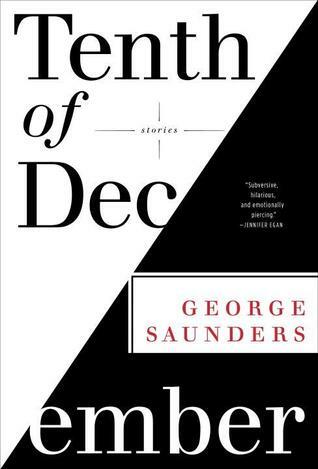 Saunders dives straight into the darkest places of the human heart and brings them to light with grace, wit, and humor. He is, without a doubt, one of the best short story writers I have had the pleasure to read and I can’t wait to get my hands on more of his stuff. There are stories here about everything, love, loss, anger, war, science, relationships, the things that make us human, but there is one common thread that runs through the middle of all of them; the idea of right and wrong and how it relates to humanity. And while you may be shaking your head and saying, every book/story/song is, at its core, about this idea of right and wrong I would encourage you to take a look at morality through Saunder’s eyes. It’s a look at morality as I’ve never seen it before. He tackles the big questions and turns the answers on their heads. Lies become good, when the untruths we tell ourselves keep us from acting upon the deep darkness inside. When one acts out of love, harm becomes a kind of protection. Death is a weapon we use as a reminder of individuality, of choice, of control, of freedom. How hard, how very hard it is to do the right thing. And why it’s so important that we do. And while you might be thinking, wow, this sounds like a dark read (it is), let me assure you that there is a beauty there as well. Saunders reminds us of the fact that each of us, down underneath all the surface grime, is a beautiful, albeit flawed, soul. A soul who is loved, a soul who feels, a soul who needs, in a world that would stunt all those things. His characters are transparent and honest and tragic, mirrors of our own failings and misconceptions. We have to hope for better for them because, in a way, we are the same. He tells the story of the truths that exist in all of us and, by giving them names, by bringing them to light, he sets us free from them. This is a book that will make its mark on you. It will change the way you think, the way you look at the world, and maybe even the way you look at yourself. It’s a book we need to read because it’s about being human, in all its triumphant glory and all its sorrowful insignificance and sometimes, we need a reminder about what it truly means to be human. This book was one of my favourites of last year… It’s amazing to see Saunders flower like this. I’ve been a fan since In Persuasion Nation, but these stories are really onto the next level in terms of emotional depth, the subtlety and elegance of the prose, and in how Saunders puts that amazing gift of creating a vivid, convincing, intimate voice to use. Thanks for the review. I’ve just become a Saunders fan! After reading this book, I can’t wait to get my hands on the rest of them. The prose is like poetry and the stories are breathtaking. There were a few that I simply couldn’t stop thinking about and had to beg friends to read, just so we could discuss them! This is literature that can change the way we think, and can therefore change the world we live in. Thanks for stopping by, Burkean.